So I am going to see KE next weekend at the NE Megafest. I have never seen Kevin at a con before....what should I expect? Will his line be massive? How early should I show up? Does he have signing limits? Will he sketch? 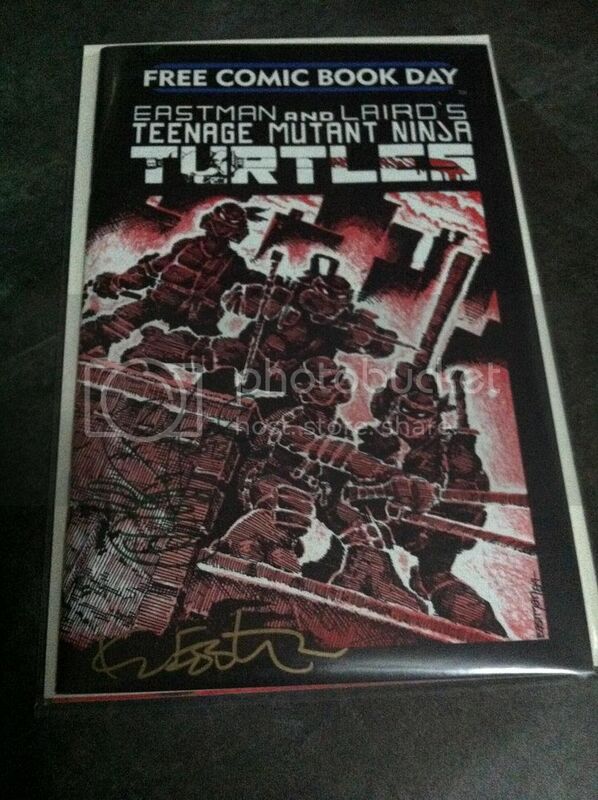 Get in as early as you can into the Kevin Eastman line if you want your stuff signed. That would be your safest bet. I've been to enough cons to see and stand in a few long lines. As for Kev's signing limits, you're on your own but it would be wise to ask first before handing anything to him to sign. I waited, no joke, 7 hours in line at NYCC in 2013 to meet him. Took up my entire Saturday & I got there just after the doors opened. I'll be there too! Totally wasn't planning on it as it's a little out of my way and KE is the only turtle artist there, but my local comic shop's facebook said the first person to come in and say "Cowabunga" would get a pair of free tickets! Pays to live close by (and procrastinate on fb)! I waited in line for Kev at Jetpack's FCBD last year for around 2 hours (got there about an hour before he showed up, which I've found is often later than stated), and that was with a "fast pass" for buying some merch. He wasn't sketching that day because of the big line but signed around 5 or 6 pieces for me with no complaint, and even did a quick turtle headsketch. Super nice guy! 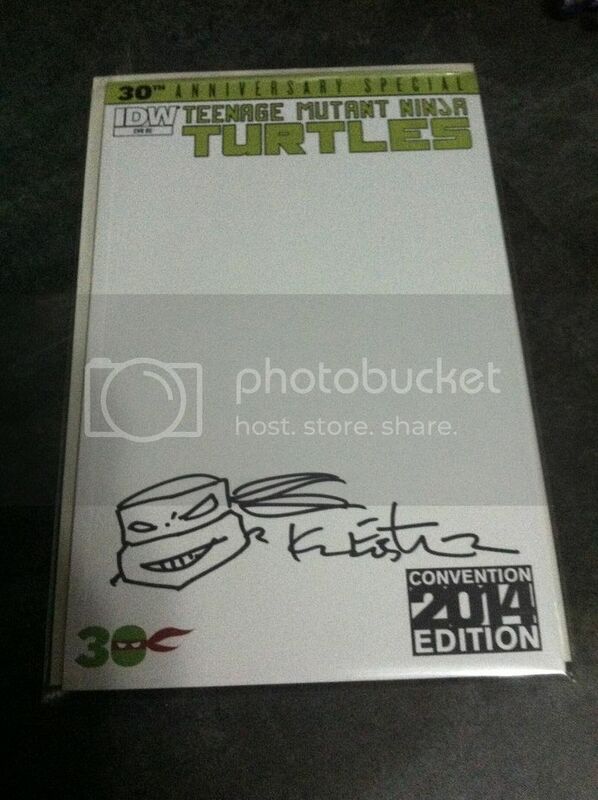 On the Megafest website it says he'll be doing sketches: http://www.newenglandsupermegafest.com/kevin-eastman/ (see lat sentence of his blurb.) He usually doesn't charge for those as far as I know, but maybe things will be different at this con where celebs are asking mad dough for a hancock... who knows? I definitely want sketch this time! Are you going both days? It looks like he has a Q+A on Sunday at 12:30, in case you didn't know. Holy Comicow! I rushed there that same morning first thing, could've been 5th in line but he wasn't there yet and I had lots of other con plans that day. Kinda glad I didn't stick it out... 7 HOURS?! Hope you had snacks! For those who have gotten sketches before, what's the level of detail, and does he take suggestions? I'd like to get one of Raph hitchhiking to our hometown (Northampton), but I don't know if that's too much to ask? Not to derail the thread from NE Super Megafest, but... Is anyone else going to VA Comicon this weekend? This will be my first time going to it (or any con besides Wizard World New Orleans and DragonCon)—not sure what to expect as far as size, or lines at artists' tables, etc. Anyone? Let's breathe new life into this thread. Is anyone going to SAC-CON in Sacramento CA on Sunday March 1st? I'd really like to find somebody to facilitate some sketches. Has anyone been to a recent comic con with Eastman? Just wondering if he does sketches and how much he charges for autographs and sketches? Also, do other artists and writers sign for free. I have heard that Eastman signs for free and other times I heard he signed first item for free. Going up to the Emerald City Comic Con in late march. I met him 3 times in the last year. In every experience the autographs are free. It's one of those things that he will sign whatever you put in front of him but you have to try to limit yourself for the sake of others. Sketches on the 2014 tour were 50 bucks. He usually limited them to 20-25 sketches a show. It may be some shows (bigger ones) cover some of Kevin's expenses etc, so he can afford to sign for free as a result. Small shows may not be able to do this, so he has to charge to break even. Awesome! I'm going to have to make plans now. Any clue on what his pricing is like for sketches etc? Thanks! I'm hoping he might be able to do something cool with my blank Shredder mirco. I'm pretty excited I haven't met anyone from Mirage yet, only Rob Paulson & Brian Tochi last year. Oh that's cool. The con nearest to me is East Coast Comic Con in April, I should be able to make a day out of it. As it stands my plan is to focus on the artists and spend less time browsing vendors as is usually the case with me. I don't know how much of a crowd I should expect specifically for either one of them so I'm going to make them a priority for sure. Just wondering if Kevin was sketching at the Amazing Arizona Comic Con last weekend... Hoping he will be sketching at Sac Con in a couple weeks. This is the closest I got to getting a sketch at Amazing Arizona Comicon. I bought this comic thinking he was going to make a big sketch on it but he was in a hurry to get through the line of fans because he had a flight to catch. I was happy though finally getting his signature after trying to two different times at two different cons, this being the third time. I also had him sign my free comic book day tmnt #1 I got signed by Peter Laird from mirage. This is probably going to get you mad......but this was posted in the Collector's Society Sketch Thread today.....guy got 5 sketches! !